I never thought of the Migos as “rappers.” Sure, they rap but they are no lyricists. And on most tracks, the trio gets out rapped by their peers. On Without Warning, the new album with Offset, 21 Savage and Metro Boomin, I kept waiting for 21 Savage’s verses. 21 has the ability to command a track. He doesn’t say much but he can tell a story and he’s charming; you kinda perk up when he comes on. Cardi then finishes her verse by calling herself "the trap Selena" and references the Daddy Yankee classic "Gasolina." It was a cute verse. But when the "queen of rap” bka as Nicki Minaj comes on, the song comes to life. Nicki always comes through with the fire innuendos and shade. Nicki can switch flows at least three times within one verse. 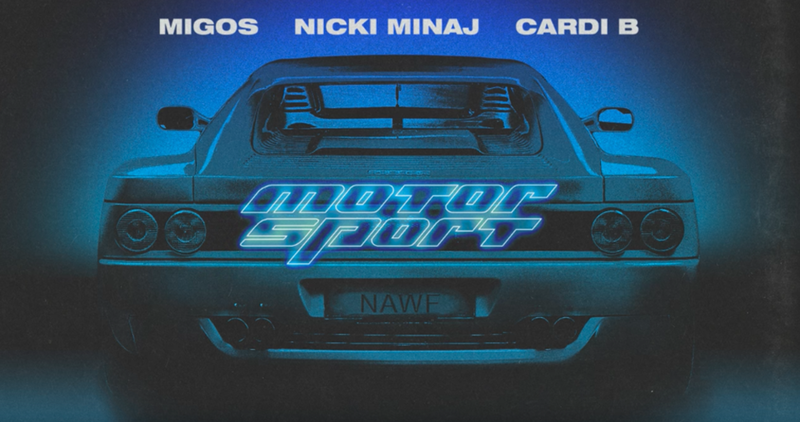 "Rap's Jackie Chan/ we ain't pullin' them fake stunts"
"I ain't tryna be violent/ But if Nicki on it, it slaps hoe"
"If Quavo the QB, I'm Nick Lombardi"
Nicki even goes on to reference a recent scandal in the Hip-Hop world — the feud between Young Dolph and Yo Gotti. Dolph was shot in Los Angeles in September, and many suspected Gotti was the culprit because of the rappers' long-standing beef. Minaj's verse aligned with popular opinion: "'Hey yo Nick, didn't you just do a hit with Gotti? '/ That too, but my n—-s send hits like Gotti." Takeoff didn’t stand a chance with his own verse after Nicki. The strength of Nicki’s verse blows him out of the water — his lines are just a skippable afterthought. Although Minaj's lines follow the same themes as her work normally does — she's rich, successful, the best in the game, etc. — it's still impressive and enjoyable. Her cleverness and ability to reference hot topics on a whim make her verse stand out. You know, I don’t know if I like Cardi B. I respect her hustle as I am all for a hard working woman but are we really taking her seriously as a rapper? I get her as a media personality and a reality TV chick but as a rapper? As in someone who raps? I just can’t get jiggy with that title. I feel the same way about others who label themselves as a rappers but lack the talent. Are ya’ll really down for listening to an entire album of Cardi B? She has ONE cute song and now it's like she's the savior of female rap. Rap career aside. Cardi’s personality is so lackluster. First, she’s called Black women roaches and now she is spewing out even more racist slurs. I hate when people try to insult and can't spell correctly. She should've kept that to herself. Many of us has said worse about Kim Jong-un, but we are smart enough not to tweet that sh!t. And at least we don’t curse out supporters who respectfully disagree. I wish these kids would stop spending their lunch money on these mean stars, Bieber, Chris Brown, etc. Cardi needs to do better. She needs to enroll in the Matthew Knowles school of media training. 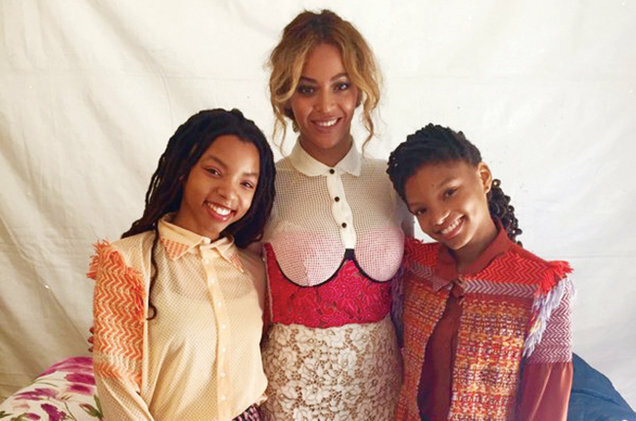 Parkwood Entertainment signees and sisters Chloe X Halle aka Chloe and Halle just released an acoustic version of Cardi B’s mega-hit single “Bodak Yellow,” a single that now sits at number two on Billboard’s Hot 100 chart. The sisters changed some of the language as it isn’t a word-for-word version of the single. Check out their rendition below. Is Cardi B a Racist? I get it. “Bodak Yellow” is a bop. It goes. But let’s be honest, can Cardi B really rap? Is she better than Nicki? True story, I’m trying to get on radio as an on-air personality. So I go to this “club” in Baltimore where they broadcast live on 92Q every Saturday night. First, I couldn’t believe that this hole in the wall was where Baltimore’s station actually broadcasts live from. Like, if I was out of town and I wanted to go to a popping club that the radio station is broadcasting from, this spot would definitely disappoint. Anywho, I’m there to meet the DJs and the on-air personalities from 92Q. They play, “Bodak Yellow” and it hit me. Cardi’s music is for girls who, if they had the body would strip their way out of the hood. But they drink too much yak and eat way too many chicken boxes so they live through Cardi. She’s the hoodbooger savior. I don’t knock anyone’s hustle but Cardi’s recent Twitter statements towards Black women have me side-eyeing her. It seems that whenever a woman of color comes for Cardi, her first response is to attack their features and call them a roach. Cardi has this weird obsession with calling people roaches that she claims comes from her Bronx upbringing. But it seems that her name calling is always geared towards Black women and especially a Black woman of darker complexion. It doesn’t get any more colorist/ anti-Black than calling a dark skinned person a ‘brunt roach.’ And it doesn’t get any more anti-Black than calling Black people monkeys either. Both insults Cardi has only directed at Black people and Black women. 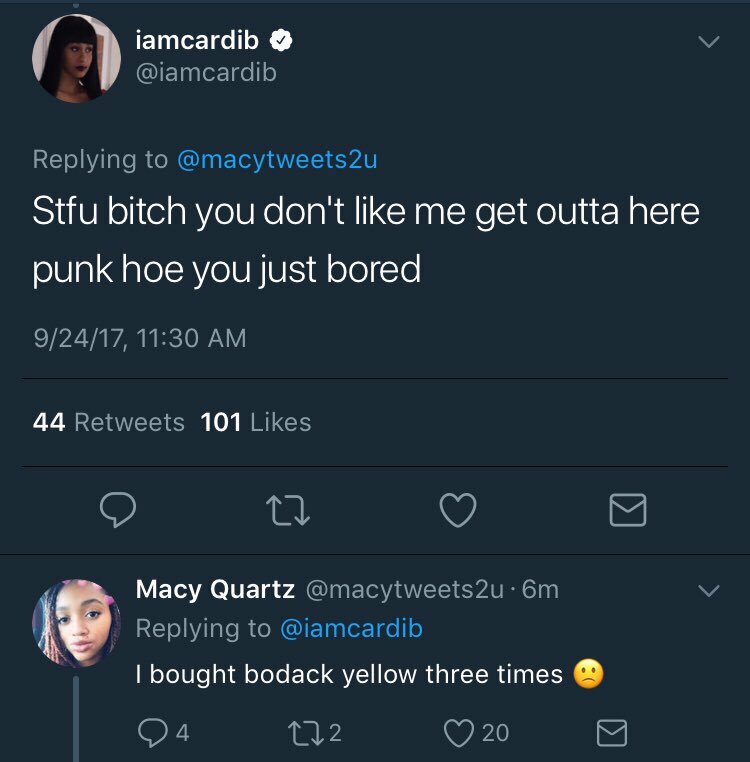 Her tweets have then been deleted but Twitter user, Jumah @WokeMutant has an entire thread of Cardi’s less than savory tweets. And don’t come for me, because you’re going to have to try harder than that ‘you must be insecure’ gas lighting tactic that people love to throw at Black women. I’m just saying, are you calling women of color roaches in your speech? 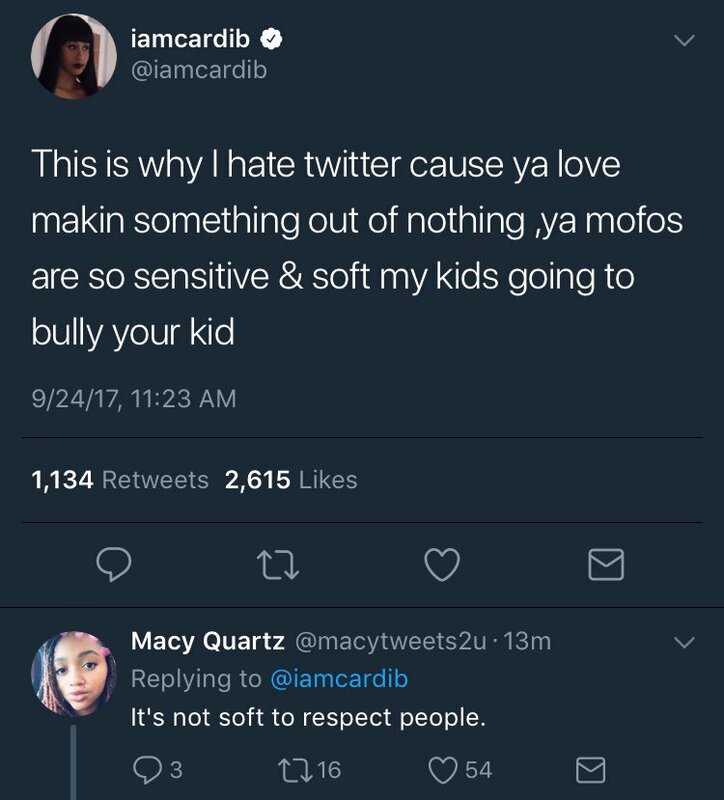 Is Cardi B cancelled or nah? Sound off below!